Properties in Saint-Philippe-d'Aiguille average 4.8 out of 5 stars. PIQUEROQUE: A haven of peace among vineyards and woods. 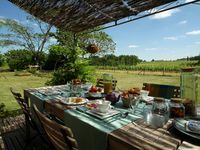 Property 2: PIQUEROQUE: A haven of peace among vineyards and woods. Property 38: Spacious villa in a landscaped garden park on the outskirts of a small village. Property 43: Beautiful cottage with breathtaking views of the countryside, calm assured. Pool, Wine and wonderful views. Property 49: Pool, Wine and wonderful views. 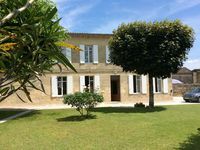 Yves and Sandra have created a delightful oasis in the midst of the vineyards in Castillon. The have got it just about perfect. We loved our room, the breakfast, and the beautiful garden area where you can be outside in comfort. The location is just 20 minutes from St. Emulsion, a charming ride.